Since the two are so similar, it is inevitable that there will be comparisons between the Ridgid EB4424 and the Grizzly T27417. But the two products are quite different. Some of the most obvious differences were covered in the first part of this review. The table on the Grizzly unit is smaller and the whole package has a much smaller footprint (16 1/2” X 18 1/2” as opposed to the Ridgid’s 19 1/4” X 23 1/2”). Because of this, I think the Ridgid on-board storage is better organized – there is simply more room across the front of the unit to organize most of the on-board accessory storage up-front where it is more convenient while the Grizzly unit scatters some of the accessories around the sides where they are less convenient. Drive rotation is opposite – the Grizzly drive shaft spins counter-clockwise while the Ridgid spins clockwise. Thus the belts and drums turn in opposite directions on the two units. A consequence of this is that the Ridgid unit requires a left-hand thread on the knob that tightens down the sanding drums and the Grizzly unit uses a normal right-hand thread to keep things from working loose during sanding. These are just the obvious physical differences readily apparent from the outside. Inside both units things are really different! As with most toys, errr, tools that I buy, I couldn’t resist tearing the Grizzly unit apart after I made sure that it was working. To my surprise, I found that the Grizzly unit is powered with a permanent magnet DC motor. 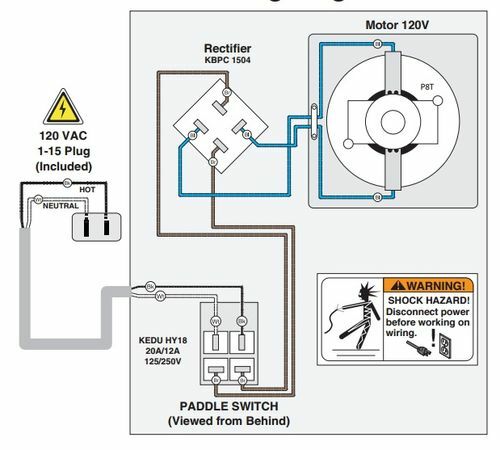 The AC power is rectified with a full-wave bridge rectifier and fed to a brushed DC permanent magnet motor. A little Googling convinced me that the Ridgid unit has a more traditional AC induction motor. I don’t believe it has brushes. The DC motor in the Grizzly unit suggests an interesting possibility. A simple DC PWM controller would convert this sander to variable speed quite easily. I haven’t used the tool enough to judge whether variable speed control is advantageous in a belt or spindle sander but I read about owners of large 3-phase spindle sanders outfitting them with VFD’s and praising the ability to vary speed. The downside, of course, is that the DC motor has brushes and brushes wear out! As a matter of fact, the user manual for the Grizzly unit has detailed instructions on how to change the brushes. There is another advantage to a permanent magnet DC motor – it uses electricity much more efficiently. An equivalent DC motor is usually smaller than its AC cousin. If you look at the specs for the two units you will find: Ridgid – current draw = 4.6A, motor = 3/8 HP; Grizzly – current draw = 3.5A, motor = 1/2 HP. AC induction motors run with a power factor approaching 0.5. This isn’t surprising, they are basically huge inductors (coils) connected to an AC power source.. If we calculate backwards from the current draw and remember that 1HP ~ 750W, you get (120V X 4.6 A X 0.5PF) / 750W/HP = .368HP – very close to the 3/8 HP spec. DC motors do not suffer from PF (DC = 0Hz, after all) but have larger I2R losses in the winding resistance. Again,calculating backwards from the current requirements, we get (120V X 3.5A) / 750W/HP = 0.56 HP. After accounting for winding losses, the real number is probably about 0.5HP. The Grizzly motor is 33% stronger but draws less current and is smaller than the Ridgid motor! The size difference between motors is not just due to AC vs DC, however. It is also due to differences in mechanical design. The oscillating mechanism that drives the spindle up and down is built into the motor housing in the Ridgid. 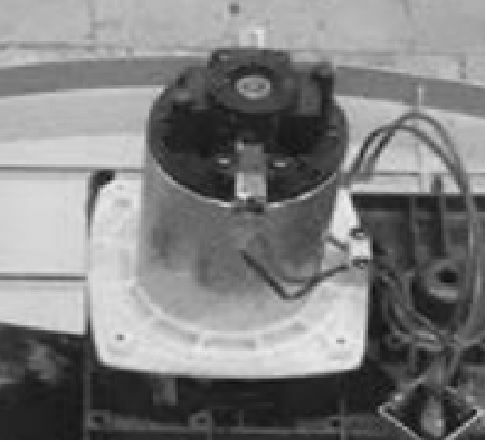 On the Grizzly unit, the oscillating mechanism is separate from the motor. In fact, this picture of the plastic mounting plate seems to show mounting holes for a larger motor. That suggests the possibility of swapping in a larger motor in the future. Of course, there are issues with mating the shaft to Grizzly internals, whether or not the mechanism can actually withstand more power, etc, etc. I don’t know whether that’s feasible. And, without more time on the sander, I don’t even know whether it is necessary. But it is obvious that, with the Ridgid design, incorporating the oscillating mechanism into the motor housing leaves you with no possibility of upgrade at all. Emerson patent – US patent #5549507, issued in 1996 – used in the Ridgid sander, this design uses a hypercycloidal planetary gear with a pin follower that rides on a pattern formed in the motor housing to generate the up-and-down motion. Ryobi patent – US patent #5558566, issued in 1996 –used in the Grizzly sander, this design uses two belts, spinning at slightly different speeds with two molded plastic forms that generate the up-and-down motion. Here is a Youtube video that shows the operation of the same mechanism used in the Grizzly sander. What I find fascinating is the two completely different design approaches to achieve the same basic functionality. Which is better? From a design standpoint, I honestly don’t know. Maintenance issues on the Grizzly design in terms of brush and belt replacement may be an issue. The Ridgid design may lead to lower maintenance costs but higher replacement costs when things do break. From a tinkerer’s standpoint, I like the Grizzly design. That may not apply to everyone, though. I simply can’t resist the urge to modify and tinker with things but many just want a tool that works. From a manufacturing standpoint, I think that the increasing number of complaints about the Ridgid unit have already made it clear that they went too far in cost-reducing what was basically a good tool to start with. Sadly, with the current business climate, the Grizzly tool may suffer the same fate as time goes by. A nice thorough review. Thank you for taking the time to do it. That was a great review. I appreciate the detail you go into in explaining how the mechanism works and the difference in motors, something most would not be bothered about, but important to those who really want to know the real differences between tools. I hope with your thoroughness, that I may read reviews on other tools. First off, great set of reviews. Most of us would not take the time or effort to investigate the differences between these. Thank you for that. First I would like to address your possibility of putting a DC variable speed drive on the Grizzly. I own a Turncrafter Commander 12” swing DC motor variable speed lathe. This unit comes with what is billed as a 1HP DC motor, with a variable speed drive. What they don’t tell you is the variable speed unit does not come with slow speed amperage compensation, and when at the slowest speed, about 450 RPM, I can grab the handwheel and literally slow down the lathe to almost 200 RPM. Somehow, I don’t think I should be able to do that. With a large piece of wood on board, I can literally stop the DC motor, (no, not belt slip), without tripping the DC drive. I would think that any DC drive that would have amperage/torque compensation would be too expensive for the Grizzly. Correct me if I am wrong. Emerson patent that uses an attached oscillating mechanism with no belts. For me, less parts, less things to go wrong. I think in terms of the lifespan of the belts. Who knows? As far as energy draw, I think overall I would be splitting hairs. In my shop, it is usual to have a couple fans running, lots of lights, and although I run one machine at a time, the amount of time I run my Rigid is only a few minutes at most, maybe 3-4 minutes to get the current project where I need it. I then turn to the next tool, may power, maybe hand, and proceed from there. On a three-four hour run, my Rigid might run a total of 8-10 minutes. I would be interested in how you would see any difference in your electric bill over one month due to the higher efficiency of the DC motor in this unit. Like the weather, one less lighting strike is not normally a document-able event. BUT: I do like the approach that Grizzly has taken with this unit. If I waited one more year, (bought my replacement Rigid in 2015), I very well may have bought the Grizzly. Overall, I have had good to excellent success with Grizzly tools, despite some reviews to the negative. I have an Extreme Series G0513X2BF bandsaw well into year five, and a G0543 Polar Bear Spiralhead Planer that is a solid six years old, and is only on the second side of the cutters. I also own a Grizzly T10010ANV slow speed wet stone sharpening system, and I also like that, although I have only owned it for a few weeks. Overall, my experience with Grizzly has been very positive. I agree, Rigid cheapened this tool into the dust. Shame, since it played to such good reviews in the first ten years it was out. Then they got busy, and found out where they could save money. Too bad, seems to be the fate of Rigid overall. I do though, still cling to my 4512 table saw which is as accurate as the day I fixed the raise/lower worm gear, and my three Rigid drills with the 12 volt lithium cordless drills, which came with two batteries each, and I rotate the batteries for long life. Well into their fourth year, they are still going strong with no signs of failure. The saw is into its third year, and runs great. I would like to look into this Grizzly more. I think if I had not already spent my big money for the year on my shop, (Second lathe plus a sharpening system), I would think seriously about replacing my Rigid with this Grizzly, or at least supplementing it with a second system. You know, I honestly did not intend to make the review this long. But, after I found it had a DC motor and starting digging into the other differences, I got carried away. But thanks for the kind words. Nope, I don’t think you are – considering that I got less than $200 in this unit, unless there is an overwhelming advantage in having variable speed on a belt or spindle sander, it might not make any sense to add another $100 for a variable DC speed controller (and that’s a cheap one that probably suffers from the same problems you mentioned with your lathe). If I fall into an old treadmill with the controller and DC motor, though, who knows? Ryobi patent which uses two belts vs. the Emerson patent that uses an attached oscillating mechanism with no belts. For me, less parts, less things to go wrong. I think in terms of the lifespan of the belts. Who knows? I am not sure I can argue with that. I will note that the manual for the Grizzly includes detailed instructions for both brush replacement and belt replacement. What does that tell you? That they might be needed? We will see. In the meantime, the fact that it CAN be repaired easily is still a big selling point. As far as energy draw, I think overall I would be splitting hairs. Yep, you are right. That’s even neglecting the fact that power meters on houses are “true power” meters and compensate for the PF that causes the difference in current. It would still cost less on your bill to run the Ridgid because it uses less actual power. That wasn’t my point. I also like Grizzly tools. That might been enough to sway me towards this unit even without the bad rep of the Rigid. I have just had better results with any Grizzly tool I have owned. B. There has to be a reason they chose a DC motor for this unit. Did they get a batch of DC motors super cheap? Are they windshield wiper motors (https://woodgears.ca/sander/spindle_sander.html)? It would be interesting to find out why. These are great reviews. I’ve been window shopping for an oscillating spindle sander and this review placed the grizzly squarely at the top of my list. Now to set aside some cash to acquire one. I bought one of these when they first came out. All they are is a modified G0739. Mine didn`t work the best when I used it the first time. The excessive load that the belt sander added to the light duty G0739 design caused drag and pulsing and noise bindings and stalls. Called tech support and they didn`t even know this unit existed. further more they didn`t have a clue on how to steer me to a fine running unit. So we got the parts list out and between the 2 units , had new parts sent my way. Installed them and still had a problem. So here is what I did and now sander seems to work well . I modified the tensioner guide so I could apply just a little more tension. Make sure you do not apply grease to the mating nylon cams. Factory told me would fix problem. Not. When does a nylon cam need grease. C`mon man. Make sure all sliding shafts are smooth and free of binding. Also make sure the unit is assembled per the manual. When assembling the top, make sure that there is absolutely no binding or drag on the shaft. Once I got things adjusted, the unit handles the sanding belt load better and I am confident that I will get a lot more use from this sander than the Rigid pos that after 4 units in one weekend deal kind of turned me off of this design. After my teardown and re-assembly I took great care to make that that the oscillating shaft motion was smooth. I am sure that was part of my original issue. Factory assembly techniques were poor. But the belt sanding loading issues is real and can cause weird problems. After repairs I used this while installing 1500sqft of hardwood floor. It got used and is still running. I hope others out have had better luck than I did at first. Rigid design I feel is better, but this units reliability seems much better. One other note is dust collection could be better. Well, that’s distressing. Maybe Grizzly suffers from some of the same quality control issues that Ridgid has seen. I modified the tensioner guide so I could apply just a little more tension. Are you talking about the sanding belt tensioner? Or the drive belt tensioner? What mods did you make to increase tension? As I mentioned in the review, I am an inveterate tinkerer and if there are mods that can be made if I have problems with this sander in the future I would like to know what they are. Sounds like I need to clarify my change. The belt tensioner is for the lower belt. When you disassemble you will see the plate screwed down with 4 screws. My belt was so loose that it would jump a tooth under load. slotting tension pulley plate screw holes allowed for more tension. next I installed the spare 3/8×160xl belt Grizzley sent. Even with the replacement parts from Grizzley the lower belt was still very loose using the 1/4 cross section belt. But installing the wider 3/8 belt and modifying the pulley plate to increase tension was all the unit needed. About my comparison between Ridgid and Grizzley, Ridgid design manages the parts better. The table top is larger and higher quality. The Grizzley still runs and the Ridgid product died 4 times and that meant 5 trips back to Home Depot.